Zelena is the capital city of the country of the same name. Located in the south east corner of the country on a fertile delta, Zelena started as a simple farming village that used the swampy island location as a defense against local bandits. With almost 5000 people, Zelena is by far the largest city in the region. The city is divided into two districts: East Zelena and West Zelena. East Zelena is home to most of the city's industry and business as well as the densest population. West Zelena still retains some of the city's rural charm and is made up of a mix of agricultural and urban islands. 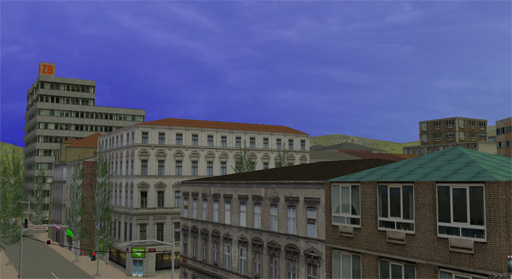 Zelena has a well developed tram system which serves as the primary mode of transportation (after walking) in the city as well as providing inter-city links within the country and even regular daily trams to SW City. The first traces of permanent settlement in Zelena are thought to be from the early 1600's as outland farmers seeking shelter from bandits and oppressive kingdoms settled on the swampy islands. With a defensible terrain, fertile land, and a location outside the spheres of most empires the village grew in peaceful isolation. Early growth was slow as almost every scrap of land had to be reclaimed from the Irenic, but the land they reclaimed was extremely fertile. With every acre of farmland requiring years of labour to create and maintain land was precious in early Zelena so the village developed a culture very aware of space-saving techniques. With cramped living conditions it became important for Zelena to master concepts such as sanitation, medicine, population control, and the civil and social infrastructure needed to keep its small but compact settlement healthy. The town grew and prospered after more efficient land-reclamation techniques were mastered and by the 1700's Zelena had around 3000 residents which was a very impressive population for the region in that era. Zelena stangnated under the Scarabian Empire and even when it regained its independence 1855 it did little to change the city. A lack of easily reclaimed land, little trade, and a government concerned more with stability than growth are cited as the main reasons for Zelena's centuries of stagnation. Even when efforts were made to industrialize the city they were met with resistance by the ruling elite who saw any change as a threat to their stability. It was only after the 1999 wool revolution did the city finally show significant growth since the 1700's. After the wool revolution the city entered into a golden age as innovation and technology flowed freely into the city. The first Kyberosoba moved into the city in early 2000 and by 2002 the ZE power cell factory was up and running and the economy booming. From 1999 to 2009 the city's population grew from 3000 to 5000 people. As of 2010 the city is still growing quickly. The economy of Zelena has been dominated by agriculture for almost all its history, but has recently developed large amounts of heavy industry, manufacturing, high-tech, and business services. Zelena produces the region's most advanced batteries, a valuable high-tech product that it holds a monopoly on due to heavy protection of its manufacturing secrets as well as controlling the only source of the rare materials required for their construction. Cement, steel, and mass-produced construction materials are other chief exports. Although no longer the top export, agricultural products still make up a large percentage of the city's economy. The city has the absolute minimum when it comes to vehicle accessible roads, many areas are only open to service and delivery vehicles. Narrow dirt paths and streets never intended for vehicles are often found outside the main business area of the city. As the city is very small geographically, simply walking or taking the city's excellent tram system is the easiest way to get around. Inter-city transport is mainly served by the Cyan Line? which links all population centers of the Zelena Republic as well as neighbouring SW City. Inter-city vehicle travel can be a hassle due to an underdeveloped road system in the region. Small docks, mostly for leisure or fishing boats are found throughout the city but the city is not served by any regular ferry. The city of Zelena has no airport. Sitting on a river delta surrounded by intensive farming, the local water was never entirely safe to drink and was a major health concern until the planetary veins were discovered deep under the city. Although lacking the rich geothermal resources as the main veins under SW City, the modest underground rivers provided clean fresh water to the region. Although some personal solar panels remain, the city's extensive wind and solar plants have mostly all been demolished since the Zjasnit atomic generator was built in 2008. A new plasma-incinerator is planned to be built in the city to handle all the region's garbage.